Good Practice Exchange on eParticipation Platforms among European Youth (2016-2-ES02-KA205-008260) is a project financed from the Erasmus+ Programme and implemented by the organization Biderborst, Boscán & Rochín (BB&R) in collaboration with H.R.Y.O. Human Rights Youth Organization and Momentum World. The project focuses on generate and exchange information, data and Best Practices between Spain, Italy and the UK regarding eParticipation Platforms to empower young Europeans on civic education. The development of technology has made ICTs central to citizens’ daily lives and relevant for political systems. In the last few years, democracies all around the world, included the European Union (EU), are facing two problems. First, a disengagement between politicians and citizens. Second, a lack of legitimacy in institutional processes at all levels. Both problems are more enhanced among young people. Within the project, one of the goals was to encourage and involve young citizens in the process of discuss and test new systems of participation for young people in political life. The project included the involvement of young students in the testing of new possible platforms and systems able to increase youth participation and improve civic competences among European youngsters. 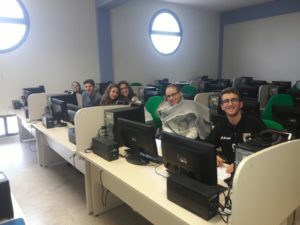 The E-PARTICIPATION Youth Session that took place in Italy involved 6 youngsters that worked with the platform DemocracyOS (http://democracyos.org), an on-line space for deliberation and voting on political proposals, a platform for a more open and participatory government. Through this platform, they had the chance to dialogue and view other proposals that were being shared through the platform, debate and create their own proposals. They were enthusiastic and they participated actively, proposing very interesting initiatives to contrast youth unemployment in Italy. In this regard, the main objective of this activity is that young people explore the platform, in order to know if they find it attractive and if they would use it in their daily lives. This information will allow us to know what aspects young people value to use a platform and what aspects keep young people away from this type of tool. To present and disseminate the outcomes and results of the project activities, H.R.Y.O. Human Rights Youth Organization will organize a local event in Palermo in the next weeks. I simply want to mention I am new to blogs and really liked your blog. Very likely I’m going to bookmark your blog . You certainly come with terrific articles. Thanks a lot for sharing your blog site. I just want to mention I’m all new to blogging and really enjoyed you’re blog. Likely I’m likely to bookmark your blog post . You really come with outstanding posts. Thanks a bunch for sharing with us your web site. Wow! Thank you! I permanently needed to write on my blog something like that. Can I implement a portion of your post to my blog? Hiya, I am really glad I have found this information. Nowadays bloggers publish just about gossip and internet stuff and this is actually irritating. A good web site with exciting content, that is what I need. Thanks for making this site, and I’ll be visiting again. Do you do newsletters by email? Thanks for one’s marvelous posting! I genuinely enjoyed reading it, you will be a great author. I will be sure to bookmark your blog and will eventually come back someday. I want to encourage yourself to continue your great posts, have a nice afternoon! Hiya, I’m really glad I’ve found this information. Today bloggers publish only about gossip and net stuff and this is really irritating. A good web site with interesting content, this is what I need. Thanks for making this web-site, and I will be visiting again. Do you do newsletters by email? Hey there. I discovered your site by way of Google while looking for a similar topic, your website came up. It looks great. I have bookmarked it in my google bookmarks to come back then. Hiya, I am really glad I’ve found this info. Nowadays bloggers publish only about gossip and net stuff and this is actually irritating. A good site with exciting content, this is what I need. Thank you for making this web site, and I’ll be visiting again. Do you do newsletters by email? Hey there. I found your site by the use of Google whilst looking for a comparable matter, your site got here up. It appears good. I have bookmarked it in my google bookmarks to visit then. Hey there. I discovered your web site by the use of Google whilst looking for a similar matter, your site got here up. It appears to be great. I’ve bookmarked it in my google bookmarks to visit then. Hi there. I found your site by way of Google at the same time as searching for a related topic, your web site got here up. It seems great. I have bookmarked it in my google bookmarks to visit then. Hiya, I’m really glad I’ve found this information. Nowadays bloggers publish just about gossip and internet stuff and this is actually annoying. A good site with exciting content, this is what I need. Thank you for making this site, and I will be visiting again. Do you do newsletters by email? Hiya, I am really glad I have found this information. Today bloggers publish only about gossip and net stuff and this is actually irritating. A good site with interesting content, this is what I need. Thanks for making this web-site, and I will be visiting again. Do you do newsletters by email? Hello there. I discovered your site by way of Google while looking for a comparable subject, your site got here up. It seems good. I have bookmarked it in my google bookmarks to visit then. Hi there. I discovered your web site by way of Google while searching for a related topic, your site got here up. It appears great. I have bookmarked it in my google bookmarks to visit then. Hi there. I found your site by way of Google even as looking for a comparable matter, your web site got here up. It seems good. I’ve bookmarked it in my google bookmarks to visit then. Hi there. I found your web site by means of Google even as looking for a similar matter, your web site came up. It seems great. I’ve bookmarked it in my google bookmarks to visit then. Hey there. I found your blog via Google whilst searching for a similar topic, your site got here up. It appears good. I’ve bookmarked it in my google bookmarks to visit then. Hiya, I’m really glad I’ve found this information. Today bloggers publish just about gossip and net stuff and this is actually frustrating. A good website with exciting content, this is what I need. Thank you for making this site, and I’ll be visiting again. Do you do newsletters by email? Hello there. I found your web site by way of Google whilst looking for a comparable topic, your site came up. It looks good. I have bookmarked it in my google bookmarks to come back then. Hiya, I’m really glad I’ve found this info. Today bloggers publish only about gossip and internet stuff and this is actually irritating. A good site with exciting content, this is what I need. Thank you for making this web site, and I’ll be visiting again. Do you do newsletters by email? Hello there. I found your website by way of Google whilst looking for a similar topic, your website came up. It seems great. I’ve bookmarked it in my google bookmarks to come back then. Hi there. I discovered your web site via Google whilst looking for a related topic, your web site got here up. It appears great. I have bookmarked it in my google bookmarks to come back then. Hi there. I discovered your blog by means of Google while searching for a similar subject, your web site got here up. It appears to be good. I have bookmarked it in my google bookmarks to visit then. Hiya, I’m really glad I’ve found this info. Today bloggers publish just about gossip and internet stuff and this is really irritating. A good site with exciting content, that is what I need. Thank you for making this web-site, and I will be visiting again. Do you do newsletters by email? Hi there. I discovered your site by the use of Google even as searching for a comparable matter, your site got here up. It looks good. I’ve bookmarked it in my google bookmarks to visit then. Hello there. I discovered your website via Google even as looking for a similar matter, your site came up. It seems great. I’ve bookmarked it in my google bookmarks to visit then. Hiya, I am really glad I’ve found this information. Nowadays bloggers publish just about gossip and net stuff and this is really annoying. A good blog with exciting content, that is what I need. Thanks for making this web-site, and I’ll be visiting again. Do you do newsletters by email? Hello there. I discovered your website via Google whilst searching for a related subject, your site got here up. It appears to be good. I’ve bookmarked it in my google bookmarks to come back then. Hey there. I found your site by means of Google while looking for a similar subject, your web site came up. It looks good. I have bookmarked it in my google bookmarks to come back then. Hiya, I’m really glad I have found this info. Nowadays bloggers publish only about gossip and web stuff and this is actually annoying. A good blog with exciting content, this is what I need. Thanks for making this web-site, and I’ll be visiting again. Do you do newsletters by email? Hi there. I found your website via Google even as searching for a related matter, your site came up. It appears to be great. I have bookmarked it in my google bookmarks to visit then. Hello there. I discovered your web site by the use of Google even as searching for a comparable matter, your website came up. It appears to be great. I’ve bookmarked it in my google bookmarks to come back then. Hey there. I discovered your site by the use of Google while searching for a comparable matter, your website came up. It appears great. I have bookmarked it in my google bookmarks to come back then. Hiya, I am really glad I’ve found this information. Today bloggers publish only about gossip and internet stuff and this is actually frustrating. A good web site with interesting content, that’s what I need. Thank you for making this web-site, and I will be visiting again. Do you do newsletters by email? Hello there. I found your blog via Google while searching for a related matter, your site got here up. It seems to be good. I’ve bookmarked it in my google bookmarks to come back then. I will right away clutch your rss feed as I can’t in finding your email subscription hyperlink or e-newsletter service. Do you’ve any? Please let me recognise so that I could subscribe. Thanks. Hiya, I’m really glad I have found this info. Today bloggers publish just about gossip and web stuff and this is really irritating. A good web site with interesting content, that is what I need. Thanks for making this web-site, and I’ll be visiting again. Do you do newsletters by email? Hiya, I’m really glad I have found this info. Nowadays bloggers publish only about gossip and web stuff and this is actually irritating. A good web site with interesting content, that’s what I need. Thanks for making this website, and I’ll be visiting again. Do you do newsletters by email? Hiya, I am really glad I have found this information. Nowadays bloggers publish just about gossip and net stuff and this is really annoying. A good blog with interesting content, that’s what I need. Thank you for making this site, and I’ll be visiting again. Do you do newsletters by email? Hiya, I am really glad I have found this information. Nowadays bloggers publish only about gossip and web stuff and this is really irritating. A good website with exciting content, this is what I need. Thanks for making this website, and I will be visiting again. Do you do newsletters by email? Hiya, I am really glad I have found this information. Nowadays bloggers publish only about gossip and net stuff and this is actually irritating. A good web site with exciting content, this is what I need. Thanks for making this site, and I will be visiting again. Do you do newsletters by email? Hi there. I found your blog by the use of Google at the same time as searching for a related matter, your site came up. It seems great. I have bookmarked it in my google bookmarks to come back then. Hello there. I discovered your website by way of Google at the same time as searching for a related subject, your website got here up. It appears great. I have bookmarked it in my google bookmarks to visit then. Hi there. I discovered your site by way of Google whilst looking for a similar topic, your website came up. It seems good. I’ve bookmarked it in my google bookmarks to visit then. Hello there. I found your web site by way of Google at the same time as looking for a similar subject, your site got here up. It appears good. I’ve bookmarked it in my google bookmarks to visit then. Hey there. I found your web site by means of Google whilst searching for a comparable subject, your web site got here up. It seems to be great. I have bookmarked it in my google bookmarks to visit then. Hiya, I am really glad I’ve found this information. Nowadays bloggers publish only about gossip and web stuff and this is actually frustrating. A good site with exciting content, that’s what I need. Thank you for making this site, and I’ll be visiting again. Do you do newsletters by email? naturally like your web site but you have to take a look at the spelling on several of your posts. Several of them are rife with spelling problems and I find it very bothersome to inform the truth nevertheless I¡¦ll surely come back again. Hiya, I am really glad I have found this information. Nowadays bloggers publish only about gossip and net stuff and this is really irritating. A good site with exciting content, that’s what I need. Thanks for making this web-site, and I will be visiting again. Do you do newsletters by email? Hi there. I discovered your site via Google while looking for a related matter, your website came up. It seems to be good. I’ve bookmarked it in my google bookmarks to visit then. Hiya, I am really glad I’ve found this info. Nowadays bloggers publish only about gossip and internet stuff and this is actually frustrating. A good blog with interesting content, that’s what I need. Thank you for making this web site, and I will be visiting again. Do you do newsletters by email? Hiya, I’m really glad I have found this info. Today bloggers publish only about gossip and web stuff and this is actually annoying. A good blog with exciting content, that is what I need. Thanks for making this website, and I will be visiting again. Do you do newsletters by email? Hey there. I discovered your blog by means of Google while searching for a related topic, your site got here up. It seems to be great. I have bookmarked it in my google bookmarks to come back then. Hey there. I discovered your blog by way of Google at the same time as looking for a related matter, your site came up. It seems to be good. I have bookmarked it in my google bookmarks to visit then. Hiya, I’m really glad I have found this information. Today bloggers publish just about gossip and net stuff and this is really irritating. A good website with interesting content, this is what I need. Thank you for making this web-site, and I will be visiting again. Do you do newsletters by email? Hiya, I’m really glad I’ve found this information. Nowadays bloggers publish just about gossip and internet stuff and this is actually irritating. A good website with exciting content, that is what I need. Thank you for making this website, and I’ll be visiting again. Do you do newsletters by email? Hello there. I found your site by means of Google even as looking for a comparable topic, your web site came up. It looks good. I have bookmarked it in my google bookmarks to come back then. Hey there. I discovered your site by the use of Google at the same time as looking for a related subject, your website got here up. It seems to be great. I’ve bookmarked it in my google bookmarks to come back then. Hi there. I found your blog by means of Google even as looking for a related subject, your site got here up. It seems great. I’ve bookmarked it in my google bookmarks to visit then. Hiya, I’m really glad I’ve found this information. Today bloggers publish just about gossip and net stuff and this is actually frustrating. A good site with exciting content, that’s what I need. Thanks for making this web site, and I will be visiting again. Do you do newsletters by email? Hello there. I discovered your web site by means of Google while looking for a related subject, your website got here up. It looks good. I have bookmarked it in my google bookmarks to come back then. Hiya, I am really glad I have found this info. Nowadays bloggers publish only about gossip and net stuff and this is really annoying. A good blog with interesting content, this is what I need. Thanks for making this web site, and I will be visiting again. Do you do newsletters by email? Hiya, I am really glad I’ve found this info. Nowadays bloggers publish just about gossip and web stuff and this is actually irritating. A good web site with exciting content, that is what I need. Thanks for making this site, and I will be visiting again. Do you do newsletters by email? Well I sincerely enjoyed reading it. This information provided by you is very effective for correct planning. Hey there. I found your web site by means of Google whilst looking for a similar topic, your web site came up. It appears to be great. I have bookmarked it in my google bookmarks to come back then. Hi there. I discovered your website via Google even as searching for a similar subject, your site came up. It seems good. I’ve bookmarked it in my google bookmarks to visit then. Hello there. I found your web site by the use of Google at the same time as looking for a related subject, your web site got here up. It appears to be good. I’ve bookmarked it in my google bookmarks to visit then. Hiya, I am really glad I have found this info. Today bloggers publish only about gossip and net stuff and this is really annoying. A good website with interesting content, that is what I need. Thanks for making this web-site, and I will be visiting again. Do you do newsletters by email? Hi there. I discovered your website via Google even as looking for a comparable topic, your website came up. It looks good. I’ve bookmarked it in my google bookmarks to visit then. Hey there. I discovered your website by way of Google while searching for a similar topic, your web site got here up. It appears good. I have bookmarked it in my google bookmarks to come back then. Hey there. I discovered your site by the use of Google while looking for a comparable subject, your website came up. It appears good. I’ve bookmarked it in my google bookmarks to visit then. Hiya, I am really glad I have found this information. Today bloggers publish just about gossip and internet stuff and this is really annoying. A good blog with exciting content, this is what I need. Thanks for making this web-site, and I’ll be visiting again. Do you do newsletters by email? Hiya, I am really glad I’ve found this info. Today bloggers publish just about gossips and web and this is really frustrating. A good website with exciting content, this is what I need. Thanks for keeping this web site, I will be visiting it. Do you do newsletters? Can not find it. Hello there. I found your web site by means of Google even as searching for a related matter, your web site got here up. It seems to be good. I’ve bookmarked it in my google bookmarks to come back then. Hi there. I found your site by means of Google even as looking for a comparable topic, your site got here up. It seems great. I’ve bookmarked it in my google bookmarks to visit then. Hiya, I am really glad I’ve found this info. Nowadays bloggers publish only about gossip and internet stuff and this is really irritating. A good site with exciting content, that’s what I need. Thank you for making this website, and I’ll be visiting again. Do you do newsletters by email? Hiya, I’m really glad I have found this information. Nowadays bloggers publish just about gossip and internet stuff and this is actually annoying. A good web site with interesting content, that’s what I need. Thank you for making this web-site, and I will be visiting again. Do you do newsletters by email? Good work, are you looking for real estate in Longwood, FL? Learn where the deals are, getbank owned property lists and find homes for sale in Winter Park. Hi there. I found your website by the use of Google even as looking for a similar topic, your web site came up. It seems to be good. I’ve bookmarked it in my google bookmarks to visit then. Hey there. I found your site by the use of Google at the same time as looking for a similar subject, your site came up. It appears good. I’ve bookmarked it in my google bookmarks to come back then. Hiya, I am really glad I have found this info. Nowadays bloggers publish only about gossip and internet stuff and this is actually annoying. A good blog with exciting content, this is what I need. Thank you for making this web-site, and I will be visiting again. Do you do newsletters by email? Hey there. I found your website by way of Google whilst searching for a comparable topic, your site got here up. It seems to be great. I’ve bookmarked it in my google bookmarks to come back then. Hiya, I am really glad I have found this information. Today bloggers publish only about gossip and web stuff and this is actually irritating. A good site with exciting content, this is what I need. Thank you for making this site, and I will be visiting again. Do you do newsletters by email? Hey there. I found your site by the use of Google while searching for a similar subject, your web site came up. It appears to be great. I have bookmarked it in my google bookmarks to come back then. Hi there. I found your blog by the use of Google while looking for a comparable matter, your website came up. It seems to be good. I have bookmarked it in my google bookmarks to come back then. Hey there. I discovered your blog by way of Google even as searching for a similar subject, your website came up. It appears to be good. I have bookmarked it in my google bookmarks to visit then. Hello there. I found your web site by the use of Google even as looking for a comparable subject, your site came up. It seems great. I’ve bookmarked it in my google bookmarks to come back then. Hey there. I found your site by the use of Google at the same time as looking for a comparable matter, your web site came up. It appears to be good. I have bookmarked it in my google bookmarks to visit then. Hiya, I am really glad I have found this information. Today bloggers publish only about gossip and web stuff and this is actually annoying. A good web site with interesting content, this is what I need. Thanks for making this web site, and I’ll be visiting again. Do you do newsletters by email? Hey there. I found your website by way of Google while looking for a similar topic, your site got here up. It appears good. I have bookmarked it in my google bookmarks to visit then. Hello there. I discovered your website via Google even as looking for a related matter, your web site came up. It seems to be good. I’ve bookmarked it in my google bookmarks to visit then. Hiya, I’m really glad I’ve found this info. Nowadays bloggers publish just about gossip and net stuff and this is actually frustrating. A good site with exciting content, that’s what I need. Thanks for making this site, and I will be visiting again. Do you do newsletters by email? Hello, Neat post. There is a problem together with your website in web explorer, might test this? IE still is the market leader and a good section of people will leave out your fantastic writing due to this problem. Hiya, I’m really glad I have found this info. Nowadays bloggers publish only about gossip and net stuff and this is actually annoying. A good site with exciting content, that is what I need. Thank you for making this web site, and I’ll be visiting again. Do you do newsletters by email? Hiya, I am really glad I’ve found this info. Today bloggers publish just about gossip and net stuff and this is really irritating. A good web site with interesting content, this is what I need. Thank you for making this web site, and I’ll be visiting again. Do you do newsletters by email? Hiya, I’m really glad I’ve found this info. Nowadays bloggers publish just about gossip and net stuff and this is actually annoying. A good web site with interesting content, this is what I need. Thank you for making this website, and I’ll be visiting again. Do you do newsletters by email? Hiya, I am really glad I have found this info. Today bloggers publish just about gossip and internet stuff and this is actually frustrating. A good website with interesting content, this is what I need. Thank you for making this website, and I will be visiting again. Do you do newsletters by email? Hiya, I’m really glad I’ve found this information. Today bloggers publish only about gossip and web stuff and this is actually frustrating. A good blog with exciting content, that is what I need. Thanks for making this site, and I’ll be visiting again. Do you do newsletters by email? Hiya, I’m really glad I have found this information. Today bloggers publish just about gossip and web stuff and this is actually frustrating. A good website with interesting content, this is what I need. Thank you for making this site, and I will be visiting again. Do you do newsletters by email? Hey there. I discovered your site by means of Google whilst searching for a related subject, your site came up. It appears to be great. I’ve bookmarked it in my google bookmarks to visit then. Hey there. I found your blog by means of Google while searching for a comparable matter, your web site came up. It seems to be good. I’ve bookmarked it in my google bookmarks to visit then. Hiya, I am really glad I’ve found this info. Nowadays bloggers publish just about gossip and web stuff and this is actually annoying. A good site with interesting content, this is what I need. Thanks for making this website, and I will be visiting again. Do you do newsletters by email? Hiya, I’m really glad I have found this info. Nowadays bloggers publish just about gossip and internet stuff and this is really annoying. A good web site with interesting content, that is what I need. Thanks for making this web site, and I’ll be visiting again. Do you do newsletters by email? Hiya, I’m really glad I have found this info. Today bloggers publish just about gossip and internet stuff and this is actually frustrating. A good blog with exciting content, this is what I need. Thank you for making this web-site, and I will be visiting again. Do you do newsletters by email? Hiya, I’m really glad I’ve found this info. Nowadays bloggers publish just about gossip and internet stuff and this is actually irritating. A good website with exciting content, this is what I need. Thanks for making this web site, and I will be visiting again. Do you do newsletters by email? Hi there. I found your web site via Google even as looking for a similar topic, your site got here up. It looks great. I have bookmarked it in my google bookmarks to visit then. Hello there. I found your web site by way of Google while looking for a comparable subject, your website got here up. It seems good. I have bookmarked it in my google bookmarks to come back then. Hi there. I discovered your web site by means of Google at the same time as looking for a similar subject, your website got here up. It appears great. I’ve bookmarked it in my google bookmarks to come back then. certainly like your website however you have to check the spelling on quite a few of your posts. Several of them are rife with spelling problems and I to find it very troublesome to tell the reality however I¡¦ll surely come back again. I’m still learning from you, but I’m trying to reach my goals. I absolutely liked reading all that is written on your blog.Keep the information coming. I enjoyed it! Hello there. I found your web site via Google while looking for a comparable topic, your website came up. It seems good. I have bookmarked it in my google bookmarks to come back then. Hello there. I discovered your site by the use of Google at the same time as searching for a similar matter, your website got here up. It seems to be good. I have bookmarked it in my google bookmarks to visit then. Hiya, I’m really glad I’ve found this information. Nowadays bloggers publish only about gossip and internet stuff and this is really frustrating. A good website with interesting content, that is what I need. Thanks for making this web site, and I’ll be visiting again. Do you do newsletters by email? Hello there. I discovered your blog by the use of Google even as looking for a comparable matter, your website came up. It seems great. I’ve bookmarked it in my google bookmarks to come back then. I have been examinating out a few of your articles and i can claim nice stuff. I will make sure to bookmark your website. Hiya, I’m really glad I have found this information. Nowadays bloggers publish just about gossip and internet stuff and this is really frustrating. A good site with interesting content, this is what I need. Thank you for making this web site, and I will be visiting again. Do you do newsletters by email? Hiya, I’m really glad I’ve found this information. Today bloggers publish just about gossip and net stuff and this is really frustrating. A good web site with interesting content, this is what I need. Thanks for making this web site, and I’ll be visiting again. Do you do newsletters by email? Hiya, I am really glad I have found this information. Nowadays bloggers publish only about gossip and web stuff and this is actually frustrating. A good blog with interesting content, this is what I need. Thanks for making this web-site, and I’ll be visiting again. Do you do newsletters by email? Hello there. I discovered your site via Google even as searching for a similar subject, your website got here up. It appears good. I have bookmarked it in my google bookmarks to come back then. Hiya, I am really glad I have found this info. Today bloggers publish only about gossip and net stuff and this is actually irritating. A good site with interesting content, that’s what I need. Thanks for making this website, and I will be visiting again. Do you do newsletters by email? Hiya, I’m really glad I have found this information. Today bloggers publish only about gossip and web stuff and this is actually annoying. A good website with exciting content, that is what I need. Thanks for making this site, and I’ll be visiting again. Do you do newsletters by email? Hello there. I discovered your website by means of Google even as searching for a similar matter, your web site got here up. It appears to be good. I have bookmarked it in my google bookmarks to visit then. Hi there. I discovered your blog by the use of Google while looking for a related topic, your site came up. It appears to be great. I have bookmarked it in my google bookmarks to visit then. Hiya, I am really glad I’ve found this information. Today bloggers publish only about gossip and internet stuff and this is actually irritating. A good blog with exciting content, this is what I need. Thank you for making this web site, and I’ll be visiting again. Do you do newsletters by email? I do consider all of the ideas you’ve introduced in your post. They are really convincing and can definitely work. Still, the posts are too quick for newbies. May you please extend them a little from next time? Thanks for the post. Hiya, I’m really glad I’ve found this information. Today bloggers publish only about gossip and net stuff and this is actually frustrating. A good blog with exciting content, that’s what I need. Thank you for making this website, and I will be visiting again. Do you do newsletters by email? Hey there. I discovered your website by way of Google even as searching for a comparable matter, your website came up. It appears good. I have bookmarked it in my google bookmarks to come back then. Hey there. I found your blog by the use of Google whilst searching for a related subject, your web site got here up. It appears to be great. I have bookmarked it in my google bookmarks to come back then. Its like you read my mind! You appear to know a lot about this, like you wrote the book in it or something. I think that you can do with a few pics to drive the message home a little bit, but other than that, this is magnificent blog. A fantastic read. I will definitely be back. Hiya, I am really glad I have found this information. Nowadays bloggers publish just about gossip and internet stuff and this is really frustrating. A good site with exciting content, that is what I need. Thanks for making this web-site, and I will be visiting again. Do you do newsletters by email? Hi there. I discovered your website by means of Google whilst searching for a similar topic, your web site came up. It appears to be good. I’ve bookmarked it in my google bookmarks to visit then. Hello there. I discovered your site by means of Google even as looking for a related matter, your website came up. It seems good. I’ve bookmarked it in my google bookmarks to come back then. Hiya, I’m really glad I have found this info. Today bloggers publish only about gossip and net stuff and this is actually annoying. A good blog with exciting content, this is what I need. Thanks for making this web site, and I will be visiting again. Do you do newsletters by email? Hiya, I am really glad I’ve found this info. Nowadays bloggers publish just about gossip and web stuff and this is really irritating. A good website with interesting content, that’s what I need. Thank you for making this website, and I’ll be visiting again. Do you do newsletters by email? Hello there. I discovered your site via Google at the same time as searching for a comparable subject, your website got here up. It appears to be great. I have bookmarked it in my google bookmarks to come back then. Hiya, I am really glad I have found this information. Nowadays bloggers publish just about gossip and net stuff and this is really annoying. A good website with exciting content, that is what I need. Thanks for making this web site, and I’ll be visiting again. Do you do newsletters by email? Hey there. I found your web site by means of Google whilst searching for a related subject, your web site got here up. It appears great. I have bookmarked it in my google bookmarks to visit then. Hiya, I am really glad I’ve found this info. Today bloggers publish only about gossip and web stuff and this is actually irritating. A good web site with exciting content, this is what I need. Thanks for making this web-site, and I will be visiting again. Do you do newsletters by email? Hi there. I discovered your blog by way of Google even as searching for a comparable matter, your site came up. It seems to be good. I have bookmarked it in my google bookmarks to visit then. I have been exploring for a bit for any high quality articles or weblog posts in this kind of area . Exploring in Yahoo I ultimately stumbled upon this web site. Studying this information So i¡¦m glad to convey that I’ve a very good uncanny feeling I discovered exactly what I needed. I so much unquestionably will make sure to don¡¦t overlook this site and provides it a glance regularly. Hiya, I’m really glad I’ve found this info. Nowadays bloggers publish only about gossip and web stuff and this is really annoying. A good website with exciting content, this is what I need. Thanks for making this web site, and I will be visiting again. Do you do newsletters by email? Hi there. I found your web site by way of Google even as searching for a comparable topic, your website got here up. It appears to be good. I have bookmarked it in my google bookmarks to come back then. Hiya, I am really glad I have found this information. Nowadays bloggers publish just about gossip and web stuff and this is actually irritating. A good web site with exciting content, that’s what I need. Thank you for making this web site, and I’ll be visiting again. Do you do newsletters by email? Hello there. I found your website by way of Google while searching for a similar matter, your website got here up. It seems great. I have bookmarked it in my google bookmarks to visit then. Hello there. I found your website by way of Google even as searching for a comparable matter, your site came up. It seems good. I have bookmarked it in my google bookmarks to come back then. Hiya, I am really glad I’ve found this information. Nowadays bloggers publish only about gossip and internet stuff and this is really irritating. A good web site with exciting content, that’s what I need. Thanks for making this website, and I will be visiting again. Do you do newsletters by email? Hiya, I’m really glad I’ve found this information. Nowadays bloggers publish only about gossip and internet stuff and this is really irritating. A good blog with interesting content, this is what I need. Thanks for making this web site, and I will be visiting again. Do you do newsletters by email? Hiya, I am really glad I’ve found this information. Today bloggers publish just about gossip and internet stuff and this is really frustrating. A good web site with interesting content, that is what I need. Thanks for making this web site, and I’ll be visiting again. Do you do newsletters by email? Hiya, I’m really glad I’ve found this info. Nowadays bloggers publish only about gossip and internet stuff and this is really annoying. A good website with exciting content, this is what I need. Thank you for making this site, and I will be visiting again. Do you do newsletters by email? Hello there. I discovered your blog by the use of Google at the same time as searching for a similar topic, your site got here up. It seems great. I’ve bookmarked it in my google bookmarks to visit then. It’s perfect time to make some plans for the future and it’s time to be happy. I’ve read this post and if I could I desire to suggest you some interesting things or advice. Maybe you could write next articles referring to this article. I want to read more things about it! Hello there. I found your website by the use of Google at the same time as looking for a related subject, your site came up. It seems to be good. I’ve bookmarked it in my google bookmarks to visit then. Hi there. I found your website by the use of Google at the same time as searching for a related topic, your web site got here up. It appears to be great. I’ve bookmarked it in my google bookmarks to visit then. I’ve been browsing online greater than 3 hours as of late, but I never found any interesting article like yours. It is pretty value sufficient for me. In my opinion, if all site owners and bloggers made good content as you probably did, the net will probably be much more useful than ever before. Hi there. I discovered your site via Google at the same time as looking for a related topic, your web site got here up. It seems great. I’ve bookmarked it in my google bookmarks to visit then. Hey there. I found your site by the use of Google even as searching for a related matter, your website came up. It seems great. I’ve bookmarked it in my google bookmarks to come back then. Hiya, I am really glad I’ve found this information. Nowadays bloggers publish just about gossip and web stuff and this is really annoying. A good blog with interesting content, this is what I need. Thanks for making this web-site, and I will be visiting again. Do you do newsletters by email? Hey there. I discovered your website via Google even as looking for a related topic, your web site got here up. It seems good. I have bookmarked it in my google bookmarks to visit then. Hi there. I discovered your web site by way of Google even as searching for a comparable topic, your website came up. It appears great. I have bookmarked it in my google bookmarks to visit then. Hi there. I discovered your blog by way of Google at the same time as searching for a related matter, your web site came up. It seems to be great. I have bookmarked it in my google bookmarks to come back then. Hiya, I am really glad I have found this information. Nowadays bloggers publish just about gossip and web stuff and this is actually frustrating. A good web site with interesting content, this is what I need. Thanks for making this web-site, and I will be visiting again. Do you do newsletters by email? Hiya, I am really glad I have found this information. Today bloggers publish just about gossip and net stuff and this is really irritating. A good blog with interesting content, that’s what I need. Thank you for making this web-site, and I’ll be visiting again. Do you do newsletters by email? Hey there. I found your website via Google while searching for a similar matter, your web site came up. It seems good. I’ve bookmarked it in my google bookmarks to come back then. Hello there. I found your blog via Google whilst searching for a comparable subject, your website came up. It appears good. I have bookmarked it in my google bookmarks to visit then. Hello there. I discovered your blog by way of Google whilst looking for a related topic, your web site came up. It seems to be great. I’ve bookmarked it in my google bookmarks to come back then. Good ¡V I should certainly pronounce, impressed with your website. I had no trouble navigating through all tabs as well as related info ended up being truly easy to do to access. I recently found what I hoped for before you know it at all. Quite unusual. Is likely to appreciate it for those who add forums or anything, site theme . a tones way for your client to communicate. Excellent task..
Hello there. I found your blog via Google at the same time as looking for a comparable matter, your website came up. It looks great. I’ve bookmarked it in my google bookmarks to come back then. Hiya, I’m really glad I have found this info. Today bloggers publish just about gossip and web stuff and this is actually frustrating. A good site with interesting content, this is what I need. Thank you for making this web site, and I’ll be visiting again. Do you do newsletters by email? Hello there. I found your blog by the use of Google at the same time as looking for a similar subject, your website came up. It appears to be good. I have bookmarked it in my google bookmarks to come back then. Great ¡V I should definitely pronounce, impressed with your website. I had no trouble navigating through all tabs as well as related information ended up being truly simple to do to access. I recently found what I hoped for before you know it at all. Reasonably unusual. Is likely to appreciate it for those who add forums or something, website theme . a tones way for your client to communicate. Excellent task..
Hiya, I am really glad I’ve found this info. Today bloggers publish only about gossip and web stuff and this is actually annoying. A good blog with interesting content, that’s what I need. Thank you for making this web-site, and I’ll be visiting again. Do you do newsletters by email? Hiya, I am really glad I’ve found this info. Nowadays bloggers publish just about gossip and web stuff and this is really frustrating. A good website with interesting content, this is what I need. Thank you for making this site, and I will be visiting again. Do you do newsletters by email? Hiya, I’m really glad I’ve found this info. Nowadays bloggers publish just about gossip and web stuff and this is actually frustrating. A good site with interesting content, this is what I need. Thank you for making this website, and I’ll be visiting again. Do you do newsletters by email? Hi there. I discovered your blog by the use of Google whilst looking for a related matter, your site came up. It seems to be good. I have bookmarked it in my google bookmarks to visit then. Hiya, I’m really glad I have found this info. Today bloggers publish only about gossip and web stuff and this is actually frustrating. A good website with exciting content, this is what I need. Thank you for making this web-site, and I will be visiting again. Do you do newsletters by email? Hiya, I am really glad I have found this information. Today bloggers publish only about gossip and web stuff and this is really annoying. A good blog with exciting content, this is what I need. Thank you for making this web-site, and I’ll be visiting again. Do you do newsletters by email? Hiya, I am really glad I have found this information. Today bloggers publish just about gossip and web stuff and this is actually frustrating. A good site with exciting content, that’s what I need. Thanks for making this web site, and I’ll be visiting again. Do you do newsletters by email? Hiya, I am really glad I’ve found this info. Nowadays bloggers publish just about gossip and net stuff and this is really irritating. A good blog with exciting content, that’s what I need. Thank you for making this website, and I’ll be visiting again. Do you do newsletters by email? Hi there. I discovered your site by means of Google at the same time as searching for a similar topic, your web site got here up. It seems to be great. I’ve bookmarked it in my google bookmarks to visit then. Hello there. I found your blog by the use of Google while looking for a comparable topic, your web site came up. It looks good. I’ve bookmarked it in my google bookmarks to come back then. Hi there. I found your website by the use of Google whilst looking for a related topic, your website got here up. It seems great. I’ve bookmarked it in my google bookmarks to come back then. Hiya, I’m really glad I’ve found this info. Today bloggers publish only about gossip and internet stuff and this is really irritating. A good website with interesting content, this is what I need. Thanks for making this site, and I’ll be visiting again. Do you do newsletters by email? Hi there. I discovered your website by the use of Google at the same time as searching for a related topic, your website came up. It appears good. I’ve bookmarked it in my google bookmarks to come back then. Hey there. I found your blog via Google even as looking for a similar subject, your website came up. It appears to be great. I’ve bookmarked it in my google bookmarks to come back then. Hello there. I found your blog via Google at the same time as searching for a comparable subject, your website came up. It looks great. I’ve bookmarked it in my google bookmarks to come back then. Hey there. I found your blog by the use of Google whilst searching for a similar matter, your site came up. It seems to be great. I’ve bookmarked it in my google bookmarks to come back then. Hello there. I discovered your site by way of Google whilst looking for a related matter, your website came up. It seems to be great. I’ve bookmarked it in my google bookmarks to visit then. I must point out my gratitude for your generosity in support of those who actually need help with that matter. Your real dedication to getting the message up and down was pretty interesting and have truly empowered individuals just like me to get to their ambitions. Your amazing warm and helpful hints and tips implies this much a person like me and much more to my office colleagues. Regards; from everyone of us. I was just seeking this information for a while. After 6 hours of continuous Googleing, at last I got it in your site. I wonder what’s the lack of Google strategy that don’t rank this kind of informative web sites in top of the list. Usually the top sites are full of garbage. I happen to be commenting to let you know what a remarkable experience our child went through reading yuor web blog. She mastered such a lot of pieces, which include what it’s like to possess a marvelous coaching style to let the rest easily fully grasp specific impossible topics. You undoubtedly exceeded her desires. Thanks for imparting those priceless, dependable, edifying and even easy tips on that topic to Sandra. Hello there. I found your website by means of Google at the same time as looking for a related subject, your site came up. It seems good. I have bookmarked it in my google bookmarks to come back then. Great ¡V I should certainly pronounce, impressed with your web site. I had no trouble navigating through all the tabs as well as related information ended up being truly simple to do to access. I recently found what I hoped for before you know it at all. Quite unusual. Is likely to appreciate it for those who add forums or something, website theme . a tones way for your customer to communicate. Nice task..
Hiya, I’m really glad I’ve found this information. Today bloggers publish only about gossip and internet stuff and this is really irritating. A good site with interesting content, this is what I need. Thank you for making this website, and I will be visiting again. Do you do newsletters by email? Hi there. I discovered your web site via Google whilst searching for a related subject, your website came up. It seems to be good. I’ve bookmarked it in my google bookmarks to come back then. Fantastic goods from you, man. I have understand your stuff previous to and you are just extremely fantastic. I actually like what you’ve acquired here, certainly like what you are stating and the way in which you say it. You make it entertaining and you still care for to keep it wise. I can not wait to read far more from you. This is actually a tremendous site. You could certainly see your enthusiasm within the work you write. The sector hopes for more passionate writers like you who are not afraid to mention how they believe. All the time go after your heart. Hiya, I’m really glad I have found this info. Nowadays bloggers publish only about gossip and net stuff and this is actually annoying. A good blog with exciting content, this is what I need. Thanks for making this website, and I will be visiting again. Do you do newsletters by email? Hi there. I found your web site by the use of Google at the same time as searching for a related topic, your web site came up. It appears to be great. I’ve bookmarked it in my google bookmarks to come back then. Hiya, I’m really glad I have found this information. Today bloggers publish just about gossip and web stuff and this is really annoying. A good website with interesting content, that’s what I need. Thank you for making this website, and I’ll be visiting again. Do you do newsletters by email? Hiya, I’m really glad I’ve found this info. Today bloggers publish only about gossip and web stuff and this is really irritating. A good blog with exciting content, this is what I need. Thanks for making this site, and I’ll be visiting again. Do you do newsletters by email? Hello there. I discovered your website by way of Google whilst searching for a comparable topic, your web site came up. It seems to be good. I’ve bookmarked it in my google bookmarks to come back then. Hi there. I discovered your website by the use of Google whilst searching for a similar topic, your website came up. It seems good. I have bookmarked it in my google bookmarks to visit then. Hey there. I discovered your website by way of Google while looking for a comparable subject, your web site came up. It seems great. I’ve bookmarked it in my google bookmarks to come back then. Hello there. I found your blog via Google even as searching for a comparable topic, your web site got here up. It appears to be great. I’ve bookmarked it in my google bookmarks to visit then. Wow! Thank you! I always wanted to write on my blog something like that. Can I include a part of your post to my blog? A person necessarily help to make severely posts I might state. That is the first time I frequented your web page and to this point? I amazed with the analysis you made to create this particular put up extraordinary. Wonderful process! I’m still learning from you, but I’m trying to reach my goals. I absolutely love reading all that is written on your website.Keep the aarticles coming. I enjoyed it! Appreciate it for helping out, fantastic info. “Riches cover a multitude of woes.” by Menander. Hiya, I am really glad I’ve found this info. Today bloggers publish just about gossip and web stuff and this is actually annoying. A good blog with interesting content, this is what I need. Thank you for making this website, and I’ll be visiting again. Do you do newsletters by email? Hiya, I am really glad I have found this information. Nowadays bloggers publish only about gossip and internet stuff and this is really irritating. A good web site with interesting content, this is what I need. Thank you for making this web site, and I’ll be visiting again. Do you do newsletters by email? I genuinely enjoy reading through on this site, it contains wonderful posts . “One doesn’t discover new lands without consenting to lose sight of the shore for a very long time.” by Andre Gide. Hiya, I am really glad I’ve found this info. Nowadays bloggers publish just about gossip and net stuff and this is really frustrating. A good website with exciting content, that is what I need. Thank you for making this web-site, and I’ll be visiting again. Do you do newsletters by email? Hiya, I’m really glad I have found this information. Today bloggers publish only about gossip and net stuff and this is really frustrating. A good blog with interesting content, this is what I need. Thanks for making this site, and I’ll be visiting again. Do you do newsletters by email? Wow! This can be one particular of the most helpful blogs We have ever arrive across on this subject. Basically Fantastic. I am also a specialist in this topic so I can understand your hard work. I’ve learn a few just right stuff here. Definitely price bookmarking for revisiting. I wonder how much attempt you place to create any such wonderful informative site. I really like your writing style, superb information, thanks for posting :D. “All words are pegs to hang ideas on.” by Henry Ward Beecher. Appreciate it for helping out, wonderful information. “Hope is the denial of reality.” by Margaret Weis. Hey there. I discovered your web site by means of Google whilst looking for a related subject, your website got here up. It seems great. I’ve bookmarked it in my google bookmarks to visit then. Hi there. I found your web site by the use of Google whilst searching for a related topic, your web site came up. It seems to be good. I’ve bookmarked it in my google bookmarks to come back then. Hi there. I discovered your site by the use of Google while looking for a related matter, your web site got here up. It looks good. I have bookmarked it in my google bookmarks to come back then. Hello there. I found your site by way of Google whilst looking for a similar matter, your site got here up. It looks great. I have bookmarked it in my google bookmarks to come back then. Hi there. I found your site by means of Google even as looking for a similar subject, your web site came up. It appears good. I’ve bookmarked it in my google bookmarks to come back then. Hiya, I’m really glad I have found this info. Today bloggers publish only about gossip and net stuff and this is actually annoying. A good web site with interesting content, this is what I need. Thank you for making this site, and I’ll be visiting again. Do you do newsletters by email? Hi there. I discovered your blog by means of Google while looking for a similar subject, your web site came up. It seems good. I have bookmarked it in my google bookmarks to come back then. Hiya, I’m really glad I’ve found this information. Nowadays bloggers publish just about gossip and net stuff and this is actually frustrating. A good website with interesting content, this is what I need. Thanks for making this web site, and I will be visiting again. Do you do newsletters by email? Hello there. I found your site by means of Google while looking for a related matter, your website got here up. It seems to be great. I have bookmarked it in my google bookmarks to come back then. Hi there. I found your site by means of Google at the same time as looking for a related subject, your site got here up. It appears to be great. I’ve bookmarked it in my google bookmarks to visit then. Great site. A lot of useful info here. I’m sending it to several pals ans also sharing in delicious. And certainly, thanks to your effort! Hello there. I discovered your site by means of Google even as looking for a comparable topic, your website came up. It looks good. I have bookmarked it in my google bookmarks to visit then. Hello there. I found your website by means of Google whilst searching for a comparable matter, your web site came up. It looks great. I have bookmarked it in my google bookmarks to visit then. Hiya, I am really glad I have found this information. Nowadays bloggers publish only about gossip and internet stuff and this is really frustrating. A good web site with exciting content, this is what I need. Thanks for making this website, and I’ll be visiting again. Do you do newsletters by email? Thanks for every other informative blog. Where else may just I am getting that kind of information written in such a perfect manner? I have a project that I’m just now working on, and I have been at the glance out for such info. whoah this weblog is great i like studying your posts. Stay up the great work! You already know, lots of persons are searching around for this info, you could help them greatly. Great site. Lots of useful information here. I’m sending it to a few buddies ans additionally sharing in delicious. And certainly, thanks for your sweat! Hi there. I discovered your blog via Google even as searching for a similar topic, your website came up. It appears to be great. I have bookmarked it in my google bookmarks to come back then. Hiya, I am really glad I’ve found this info. Today bloggers publish just about gossip and internet stuff and this is actually irritating. A good web site with interesting content, that’s what I need. Thank you for making this web-site, and I’ll be visiting again. Do you do newsletters by email? Hi there. I discovered your site by the use of Google at the same time as searching for a related matter, your web site got here up. It appears good. I have bookmarked it in my google bookmarks to come back then. Hiya, I’m really glad I’ve found this information. Nowadays bloggers publish only about gossip and net stuff and this is actually irritating. A good web site with exciting content, that is what I need. Thank you for making this web-site, and I will be visiting again. Do you do newsletters by email? Hello there. I discovered your site via Google at the same time as searching for a similar matter, your web site came up. It appears great. I have bookmarked it in my google bookmarks to visit then. I like what you guys are up too. Such smart work and reporting! Carry on the excellent works guys I’ve incorporated you guys to my blogroll. I think it’ll improve the value of my website :). Hiya, I am really glad I’ve found this information. Today bloggers publish only about gossip and web stuff and this is actually annoying. A good site with interesting content, that is what I need. Thank you for making this site, and I will be visiting again. Do you do newsletters by email? Hiya, I am really glad I have found this info. Today bloggers publish just about gossip and internet stuff and this is really irritating. A good website with exciting content, this is what I need. Thank you for making this site, and I will be visiting again. Do you do newsletters by email? Great amazing issues here. I¡¦m very happy to peer your article. Thanks a lot and i am having a look ahead to touch you. Will you kindly drop me a mail? Hiya, I’m really glad I have found this info. Today bloggers publish only about gossip and internet stuff and this is really frustrating. A good site with exciting content, this is what I need. Thank you for making this site, and I’ll be visiting again. Do you do newsletters by email? Thanks , I’ve recently been looking for info approximately this topic for ages and yours is the best I’ve came upon till now. But, what about the conclusion? Are you sure about the supply? Hello there. I discovered your website by the use of Google while searching for a comparable subject, your website came up. It appears good. I’ve bookmarked it in my google bookmarks to come back then. Hiya, I’m really glad I have found this information. Nowadays bloggers publish only about gossip and web stuff and this is actually annoying. A good website with interesting content, this is what I need. Thank you for making this web site, and I will be visiting again. Do you do newsletters by email? Hiya, I am really glad I have found this information. Nowadays bloggers publish only about gossip and web stuff and this is really annoying. A good site with interesting content, that is what I need. Thanks for making this site, and I will be visiting again. Do you do newsletters by email? Hiya, I am really glad I have found this info. Today bloggers publish just about gossip and web stuff and this is actually annoying. A good blog with exciting content, that’s what I need. Thanks for making this site, and I’ll be visiting again. Do you do newsletters by email? Hey there. I discovered your site by way of Google whilst searching for a similar matter, your website got here up. It appears to be good. I have bookmarked it in my google bookmarks to come back then. Thank you, I’ve recently been looking for information approximately this subject for ages and yours is the best I’ve found out till now. However, what concerning the conclusion? Are you certain concerning the supply? Hey there. I found your site via Google even as searching for a comparable subject, your web site came up. It looks great. I’ve bookmarked it in my google bookmarks to come back then. Hey there. I discovered your site by the use of Google whilst looking for a similar subject, your website came up. It seems to be good. I’ve bookmarked it in my google bookmarks to come back then. Hiya, I’m really glad I’ve found this info. Nowadays bloggers publish just about gossip and web stuff and this is really frustrating. A good web site with interesting content, this is what I need. Thank you for making this website, and I will be visiting again. Do you do newsletters by email? Hi there. I found your site by way of Google while searching for a similar topic, your web site came up. It seems to be great. I’ve bookmarked it in my google bookmarks to come back then. Hi there. I discovered your web site via Google at the same time as looking for a comparable subject, your web site came up. It seems to be great. I’ve bookmarked it in my google bookmarks to come back then. Hiya, I’m really glad I have found this information. Today bloggers publish just about gossip and net stuff and this is really frustrating. A good web site with exciting content, that’s what I need. Thanks for making this website, and I’ll be visiting again. Do you do newsletters by email? Hello there. I found your site by the use of Google while looking for a related subject, your web site got here up. It seems great. I have bookmarked it in my google bookmarks to come back then. Hello there. I found your blog by way of Google while searching for a comparable matter, your website got here up. It appears good. I’ve bookmarked it in my google bookmarks to visit then. I was studying some of your content on this internet site and I think this site is real informative! Keep on posting. Hello there. I discovered your web site by means of Google even as looking for a related subject, your site came up. It looks good. I have bookmarked it in my google bookmarks to come back then. Hiya, I am really glad I’ve found this information. Today bloggers publish just about gossip and net stuff and this is actually frustrating. A good web site with exciting content, that’s what I need. Thank you for making this web-site, and I’ll be visiting again. Do you do newsletters by email? Hiya, I am really glad I have found this information. Nowadays bloggers publish just about gossip and web stuff and this is actually annoying. A good website with exciting content, that is what I need. Thank you for making this web-site, and I’ll be visiting again. Do you do newsletters by email? Hey there. I found your blog by the use of Google whilst searching for a comparable subject, your website came up. It appears to be good. I’ve bookmarked it in my google bookmarks to come back then. Hiya, I’m really glad I’ve found this info. Nowadays bloggers publish just about gossip and internet stuff and this is really irritating. A good blog with exciting content, that is what I need. Thank you for making this web site, and I will be visiting again. Do you do newsletters by email? Hiya, I’m really glad I have found this info. Nowadays bloggers publish just about gossip and web stuff and this is actually frustrating. A good blog with exciting content, this is what I need. Thank you for making this web-site, and I’ll be visiting again. Do you do newsletters by email? Hey there. I discovered your blog via Google while searching for a related subject, your web site came up. It looks great. I’ve bookmarked it in my google bookmarks to come back then. Hiya, I’m really glad I have found this info. Today bloggers publish only about gossip and internet stuff and this is actually irritating. A good web site with exciting content, this is what I need. Thank you for making this web site, and I’ll be visiting again. Do you do newsletters by email? Hey there. I found your web site by means of Google whilst looking for a related topic, your web site got here up. It looks good. I’ve bookmarked it in my google bookmarks to come back then. Hiya, I am really glad I’ve found this information. Nowadays bloggers publish just about gossip and net stuff and this is actually annoying. A good blog with interesting content, that’s what I need. Thank you for making this web-site, and I’ll be visiting again. Do you do newsletters by email? Hi there. I discovered your web site by means of Google at the same time as searching for a comparable matter, your web site came up. It seems great. I’ve bookmarked it in my google bookmarks to come back then. Great goods from you, man. I have understand your stuff previous to and you’re just too great. I really like what you have acquired here, certainly like what you’re stating and the way in which you say it. You make it enjoyable and you still take care of to keep it sensible. I can not wait to read much more from you. This is really a wonderful website. Hiya, I am really glad I’ve found this information. Today bloggers publish only about gossip and net stuff and this is really irritating. A good website with exciting content, this is what I need. Thanks for making this web-site, and I’ll be visiting again. Do you do newsletters by email? Hey there. I found your blog by means of Google even as searching for a similar matter, your website got here up. It seems good. I’ve bookmarked it in my google bookmarks to visit then. Hey there. I discovered your blog by way of Google at the same time as looking for a comparable matter, your site got here up. It appears to be good. I’ve bookmarked it in my google bookmarks to come back then. Hiya, I’m really glad I have found this info. Today bloggers publish just about gossip and internet stuff and this is actually frustrating. A good website with exciting content, this is what I need. Thank you for making this website, and I will be visiting again. Do you do newsletters by email? Hi there. I discovered your site by means of Google at the same time as searching for a related subject, your web site came up. It seems good. I have bookmarked it in my google bookmarks to visit then. Hi there. I discovered your website by way of Google whilst searching for a related matter, your site came up. It appears good. I’ve bookmarked it in my google bookmarks to visit then. Hiya, I am really glad I have found this info. Nowadays bloggers publish just about gossip and internet stuff and this is really annoying. A good site with exciting content, this is what I need. Thanks for making this site, and I will be visiting again. Do you do newsletters by email? Thanks, I have recently been looking for info approximately this subject for ages and yours is the best I have found out so far. However, what concerning the conclusion? Are you certain concerning the source? Hello there. I found your site by way of Google while looking for a related matter, your website came up. It seems to be good. I’ve bookmarked it in my google bookmarks to visit then. Hello there. I found your website by means of Google while searching for a similar matter, your website came up. It seems good. I have bookmarked it in my google bookmarks to visit then. Hiya, I’m really glad I have found this information. Nowadays bloggers publish just about gossip and web stuff and this is actually annoying. A good site with interesting content, this is what I need. Thank you for making this website, and I will be visiting again. Do you do newsletters by email? I am extremely impressed with your writing skills and also with the layout on your weblog. Is this a paid theme or did you modify it yourself? Either way keep up the nice quality writing, it is rare to see a nice blog like this one today..
Hi there. I found your blog by the use of Google while looking for a similar subject, your website got here up. It appears great. I have bookmarked it in my google bookmarks to come back then. Hey there. I found your web site via Google whilst searching for a comparable matter, your site got here up. It seems to be good. I have bookmarked it in my google bookmarks to come back then. Hi there. I found your blog by means of Google whilst looking for a related matter, your web site got here up. It seems to be good. I have bookmarked it in my google bookmarks to come back then. fantastic issues altogether, you just won a emblem new reader. What would you recommend in regards to your post that you made some days ago? Any sure? Shame on you for making an additional great submit! Awesome stuff, keep up the superior work. I see a lot of potential! I wonder if you are an active user with any social networking web sites like Digg or Stumble Upon? I am glad for commenting to make you be aware of what a nice discovery our child developed visiting yuor web blog. She even learned too many issues, with the inclusion of how it is like to possess an awesome giving style to have certain people without hassle fully grasp specific very confusing topics. You really did more than visitors’ expected results. Many thanks for offering such necessary, trustworthy, educational as well as unique tips on that topic to Sandra. Hiya, I am really glad I have found this info. Nowadays bloggers publish just about gossip and net stuff and this is actually annoying. A good blog with interesting content, this is what I need. Thank you for making this website, and I’ll be visiting again. Do you do newsletters by email? Hiya, I’m really glad I’ve found this information. Today bloggers publish just about gossip and internet stuff and this is really annoying. A good web site with interesting content, this is what I need. Thank you for making this site, and I’ll be visiting again. Do you do newsletters by email? I just could not depart your website before suggesting that I extremely loved the standard information a person supply in your visitors? Is going to be again regularly to investigate cross-check new posts. Hello there. I discovered your web site by means of Google even as searching for a similar matter, your site came up. It seems to be good. I’ve bookmarked it in my google bookmarks to come back then. Hiya, I am really glad I’ve found this information. Nowadays bloggers publish only about gossip and internet stuff and this is really frustrating. A good site with interesting content, that is what I need. Thank you for making this web site, and I’ll be visiting again. Do you do newsletters by email? Hiya, I am really glad I’ve found this information. Today bloggers publish only about gossip and net stuff and this is actually irritating. A good website with exciting content, that’s what I need. Thanks for making this web site, and I will be visiting again. Do you do newsletters by email? Hiya, I’m really glad I’ve found this information. Nowadays bloggers publish only about gossip and internet stuff and this is really annoying. A good site with interesting content, that is what I need. Thanks for making this web-site, and I will be visiting again. Do you do newsletters by email? Someone essentially assist to make severely posts I might state. That is the first time I frequented your web page and so far? I surprised with the research you made to make this particular put up amazing. Magnificent job! I see something truly interesting about your web site so I bookmarked . A high level woman you must have a single body appearance. Is going to be most excellent construct, adult will need the customer through your self confidence and girls do imagine drawn to because of your captivating looks. Albeit numerous men desirable to generate an extremely whole a lot are certainly all set to might dozens of vexing physical trainings was needed to grow their lean muscle mass. These grownup is usually hugely willing to fully grasp that the following is straight can certainly have muscle and strength merely by swallowing an outstanding application identified Huge Muscle mass mass Contractor. My spouse and i got happy Ervin could deal with his analysis by way of the ideas he came across while using the web pages. It is now and again perplexing to just find yourself giving freely helpful hints that many some others may have been selling. Therefore we grasp we have got the writer to give thanks to for this. The entire illustrations you made, the straightforward website menu, the friendships you will aid to foster – it’s got mostly overwhelming, and it is letting our son and the family recognize that that subject matter is cool, and that is tremendously serious. Thanks for the whole lot! whoah this blog is magnificent i like reading your articles. Stay up the good paintings! You realize, many individuals are searching around for this info, you can aid them greatly. My wife and i got absolutely joyous that Emmanuel could carry out his survey from the ideas he was given through your web site. It’s not at all simplistic to simply happen to be handing out ideas which often some people have been selling. We really see we need the website owner to appreciate because of that. The most important illustrations you have made, the straightforward blog navigation, the relationships you can aid to instill – it is everything impressive, and it’s helping our son in addition to the family reckon that this situation is interesting, which is certainly especially fundamental. Thank you for the whole lot! You really make it seem really easy with your presentation however I find this topic to be actually something that I believe I’d by no means understand. It seems too complicated and very broad for me. I’m having a look ahead on your next publish, I will attempt to get the cling of it! Hiya, I am really glad I have found this info. Today bloggers publish only about gossip and internet stuff and this is really frustrating. A good blog with interesting content, this is what I need. Thank you for making this website, and I will be visiting again. Do you do newsletters by email? Hiya, I am really glad I’ve found this information. Today bloggers publish just about gossip and net stuff and this is really irritating. A good blog with interesting content, that’s what I need. Thanks for making this web-site, and I’ll be visiting again. Do you do newsletters by email? Hey there. I found your site by means of Google even as searching for a related subject, your web site got here up. It appears to be good. I’ve bookmarked it in my google bookmarks to come back then. Hey there. I discovered your site by the use of Google while looking for a similar subject, your site came up. It appears good. I’ve bookmarked it in my google bookmarks to visit then. This is the best weblog for anyone who desires to find out about this topic. You notice a lot its virtually laborious to argue with you (not that I really would want aHa). You positively put a new spin on a topic thats been written about for years. Nice stuff, simply great! of course like your web site however you have to take a look at the spelling on quite a few of your posts. Many of them are rife with spelling problems and I in finding it very troublesome to tell the reality however I will certainly come again again. I’ve been surfing online more than 3 hours today, yet I never found any interesting article like yours. It is pretty worth enough for me. In my opinion, if all site owners and bloggers made good content as you did, the internet will be a lot more useful than ever before. fantastic points altogether, you just received a new reader. What would you suggest in regards to your submit that you simply made some days ago? Any sure? Great tremendous issues here. I am very glad to peer your post. Thanks a lot and i am having a look ahead to touch you. Will you kindly drop me a mail? Appreciate it for helping out, great information. “Nobody can be exactly like me. Sometimes even I have trouble doing it.” by Tallulah Bankhead. Hi, Neat post. There’s an issue with your site in web explorer, could test this… IE nonetheless is the marketplace chief and a big section of folks will leave out your magnificent writing because of this problem. Hello there. I found your website via Google whilst searching for a related subject, your site got here up. It appears good. I have bookmarked it in my google bookmarks to come back then. Hiya, I am really glad I’ve found this info. Today bloggers publish only about gossip and internet stuff and this is actually annoying. A good website with exciting content, this is what I need. Thank you for making this web site, and I’ll be visiting again. Do you do newsletters by email? Hi there. I discovered your site by means of Google while searching for a similar subject, your web site came up. It seems great. I have bookmarked it in my google bookmarks to come back then. Hello there. I discovered your website by way of Google while looking for a related matter, your site came up. It looks great. I’ve bookmarked it in my google bookmarks to come back then. Hey there. I discovered your web site via Google whilst looking for a related matter, your web site got here up. It seems great. I have bookmarked it in my google bookmarks to visit then. Hi there. I found your site by means of Google even as looking for a similar topic, your website came up. It seems good. I’ve bookmarked it in my google bookmarks to come back then. Hiya, I am really glad I have found this information. Today bloggers publish only about gossip and net stuff and this is really annoying. A good web site with interesting content, this is what I need. Thank you for making this web-site, and I’ll be visiting again. Do you do newsletters by email? Hello there. I found your web site by the use of Google while looking for a related matter, your site came up. It seems good. I have bookmarked it in my google bookmarks to come back then. I genuinely enjoy reading through on this website , it holds excellent content . “The longing to produce great inspirations didn’t produce anything but more longing.” by Sophie Kerr. Hi there. I found your blog by means of Google whilst searching for a related subject, your website got here up. It seems to be great. I have bookmarked it in my google bookmarks to come back then. Hey there. I discovered your website by the use of Google whilst looking for a comparable subject, your site got here up. It appears to be great. I have bookmarked it in my google bookmarks to visit then. Hey there. I found your website by means of Google while searching for a related topic, your web site got here up. It appears to be great. I have bookmarked it in my google bookmarks to come back then. Hiya, I am really glad I’ve found this info. Nowadays bloggers publish only about gossip and web stuff and this is actually annoying. A good web site with exciting content, this is what I need. Thanks for making this site, and I’ll be visiting again. Do you do newsletters by email? Hiya, I am really glad I’ve found this info. Today bloggers publish just about gossip and web stuff and this is really annoying. A good web site with interesting content, this is what I need. Thank you for making this site, and I’ll be visiting again. Do you do newsletters by email? Hiya, I am really glad I’ve found this information. Nowadays bloggers publish just about gossip and internet stuff and this is really irritating. A good blog with interesting content, this is what I need. Thank you for making this website, and I’ll be visiting again. Do you do newsletters by email? Hello there. I found your web site via Google at the same time as looking for a comparable matter, your site got here up. It appears to be good. I’ve bookmarked it in my google bookmarks to come back then. Hiya, I’m really glad I have found this information. Today bloggers publish only about gossip and internet stuff and this is actually annoying. A good site with exciting content, this is what I need. Thank you for making this web-site, and I’ll be visiting again. Do you do newsletters by email? I have read a few good stuff here. Definitely price bookmarking for revisiting. I surprise how much attempt you put to create the sort of wonderful informative website. Hello, Neat post. There is an issue along with your web site in internet explorer, would check this¡K IE nonetheless is the market chief and a huge element of other people will pass over your excellent writing due to this problem. Hiya, I am really glad I’ve found this information. Nowadays bloggers publish only about gossip and internet stuff and this is really irritating. A good web site with interesting content, this is what I need. Thanks for making this website, and I’ll be visiting again. Do you do newsletters by email? Hiya, I’m really glad I’ve found this info. Nowadays bloggers publish only about gossip and web stuff and this is really irritating. A good website with interesting content, this is what I need. Thanks for making this web-site, and I will be visiting again. Do you do newsletters by email? Thanks for the sensible critique. Me & my neighbor were just preparing to do some research about this. We got a grab a book from our area library but I think I learned more from this post. I’m very glad to see such fantastic information being shared freely out there. Hello there. I discovered your website by the use of Google whilst searching for a comparable matter, your web site got here up. It appears to be good. I’ve bookmarked it in my google bookmarks to visit then. Hey there. I discovered your website by means of Google at the same time as searching for a comparable subject, your website got here up. It appears great. I have bookmarked it in my google bookmarks to come back then. Hello there. I discovered your website via Google even as looking for a similar subject, your site came up. It seems to be good. I’ve bookmarked it in my google bookmarks to come back then. Hiya, I am really glad I’ve found this info. Today bloggers publish only about gossip and net stuff and this is actually frustrating. A good blog with interesting content, that is what I need. Thank you for making this web-site, and I will be visiting again. Do you do newsletters by email? Hello there. I discovered your web site by the use of Google at the same time as looking for a related matter, your web site got here up. It appears great. I’ve bookmarked it in my google bookmarks to come back then. I will right away grasp your rss feed as I can’t to find your e-mail subscription hyperlink or newsletter service. Do you have any? Kindly allow me realize so that I could subscribe. Thanks. Hiya, I am really glad I have found this info. Today bloggers publish only about gossip and web stuff and this is actually irritating. A good web site with interesting content, that is what I need. Thank you for making this website, and I will be visiting again. Do you do newsletters by email? Hi my loved one! I wish to say that this post is awesome, nice written and include approximately all vital infos. I would like to see more posts like this . My husband and i ended up being cheerful Albert could round up his homework via the ideas he had when using the web page. It is now and again perplexing to simply choose to be freely giving techniques which usually a number of people have been selling. So we acknowledge we’ve got you to give thanks to for this. The main explanations you have made, the straightforward blog navigation, the relationships your site make it possible to instill – it’s got most unbelievable, and it’s letting our son and us recognize that this concept is thrilling, which is certainly exceptionally pressing. Thank you for the whole thing! hey there and thank you for your information – I have definitely picked up something new from right here. I did however expertise some technical issues using this site, as I experienced to reload the site lots of times previous to I could get it to load correctly. I had been wondering if your web hosting is OK? Not that I’m complaining, but slow loading instances times will very frequently affect your placement in google and can damage your high quality score if advertising and marketing with Adwords. Anyway I am adding this RSS to my email and could look out for much more of your respective exciting content. Ensure that you update this again soon.. I do believe all of the concepts you’ve presented in your post. They’re really convincing and can certainly work. Still, the posts are too quick for newbies. May just you please lengthen them a bit from next time? Thanks for the post. Hey there. I discovered your web site by way of Google whilst looking for a similar matter, your web site came up. It looks good. I’ve bookmarked it in my google bookmarks to visit then. Hiya, I’m really glad I have found this info. Nowadays bloggers publish just about gossip and net stuff and this is really frustrating. A good site with interesting content, that’s what I need. Thank you for making this site, and I’ll be visiting again. Do you do newsletters by email? Hello there. I found your website via Google at the same time as searching for a comparable subject, your site got here up. It seems to be good. I’ve bookmarked it in my google bookmarks to come back then. I am in awe of this quality unique content. You may not know how rare that is in today’s writing world. Your points of interest in this article almost match my own thoughts. Thank you. Hiya, I’m really glad I’ve found this information. Nowadays bloggers publish just about gossip and internet stuff and this is really annoying. A good website with exciting content, that is what I need. Thank you for making this website, and I will be visiting again. Do you do newsletters by email? Hi there. I found your blog by the use of Google at the same time as searching for a related topic, your website got here up. It seems good. I’ve bookmarked it in my google bookmarks to come back then. Hiya, I am really glad I’ve found this info. Nowadays bloggers publish only about gossip and web stuff and this is actually annoying. A good site with exciting content, this is what I need. Thank you for making this site, and I will be visiting again. Do you do newsletters by email? Hello there, I discovered your blog via Google at the same time as searching for a comparable matter, your website got here up, it seems to be good. I’ve bookmarked it in my google bookmarks. Hiya, I’m really glad I’ve found this information. Today bloggers publish just about gossip and internet stuff and this is actually annoying. A good site with interesting content, this is what I need. Thank you for making this web-site, and I will be visiting again. Do you do newsletters by email? Someone necessarily assist to make seriously articles I might state. That is the very first time I frequented your website page and up to now? I amazed with the research you made to make this actual publish incredible. Magnificent process! Its like you read my mind! You seem to know so much about this, like you wrote the book in it or something. I think that you could do with a few pics to drive the message home a little bit, but other than that, this is magnificent blog. A great read. I’ll definitely be back. You can definitely see your enthusiasm in the work you write. The world hopes for more passionate writers like you who are not afraid to say how they believe. At all times go after your heart. Helpful info. Fortunate me I discovered your website by chance, and I’m stunned why this coincidence did not came about earlier! I bookmarked it. Hiya, I’m really glad I have found this information. Today bloggers publish only about gossip and internet stuff and this is really irritating. A good web site with interesting content, that’s what I need. Thank you for making this web site, and I will be visiting again. Do you do newsletters by email? You have remarked very interesting points ! ps nice site. “I just wish we knew a little less about his urethra and a little more about his arms sales to Iran.” by Andrew A. Rooney. Hi, i think that i saw you visited my weblog so i came to “return the favor”.I’m trying to find things to enhance my site!I suppose its ok to use some of your ideas!! I must express my passion for your kind-heartedness supporting folks that really need assistance with that field. Your personal commitment to passing the message throughout had been especially effective and have continually empowered people like me to get to their aims. Your new warm and friendly key points denotes a whole lot to me and far more to my mates. Regards; from each one of us. Hi there. I discovered your website by the use of Google at the same time as searching for a similar matter, your web site came up. It appears to be great. I have bookmarked it in my google bookmarks to visit then. Hey there. I found your blog by means of Google whilst looking for a related subject, your website came up. It looks good. I have bookmarked it in my google bookmarks to come back then. Very interesting info !Perfect just what I was searching for! “The most wasted day of all is that on which we have not laughed.” by Sbastien-Roch Nicolas de Chamfort. hey there and thank you for your information – I have certainly picked up something new from right here. I did however expertise several technical points using this web site, since I experienced to reload the website many times previous to I could get it to load properly. I had been wondering if your web host is OK? Not that I’m complaining, but sluggish loading instances times will often affect your placement in google and can damage your high quality score if ads and marketing with Adwords. Well I’m adding this RSS to my e-mail and could look out for a lot more of your respective fascinating content. Ensure that you update this again soon..